Wendy DuBoe, CEO of United Way of Metropolitan Chicago, addressed the sold-out crowd at Leading for Good. Forty-five CEOs and top executives from the U.S., U.K., and Colombia recently spoke at the sold-out Leading for Good conference hosted by the Baumhart Center for Social Enterprise and Responsibility. 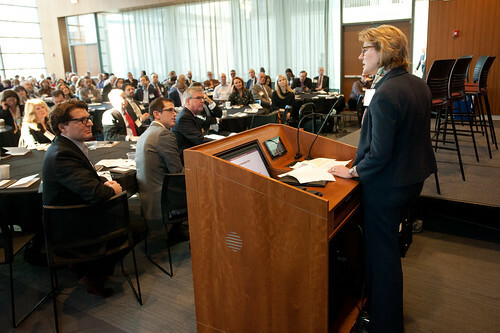 The leaders and 250 attendees discussed how to integrate business strategy and social purpose to advance the greater good. Below, watch key moments from the conference and read about the three major themes that emerged in the conversations. 1. The boundaries are blurring. Susan Crown, founder of the Susan Crown Exchange, observed that the U.S. has historically been divided into three distinct sectors: private (corporate), public (government), and social (nonprofit). But "we live in a world today where [these sectors] have converged," she said. Crown's observation was echoed throughout the day: Business strategy is increasingly essential to government and nonprofit leadership, and social purpose is increasingly essential to business leadership. 2. Cross-sectorial partnerships are vital to accomplishing large-scale goals. Wendy DuBoe, CEO of United Way of Metropolitan Chicago, opened the event with a powerful vision: "When business works hand-in-hand with civic leaders and community leaders, it can have an absolutely positive and transformative effect on society." Speakers throughout the day-including leaders from Deloitte, Edelman, ITW, JP Morgan Chase, and William Blair-unanimously agreed that businesses must work together with social and public sector partners and contribute their unique strengths to tackle today's most pressing challenges. Lisa Morrison Butler, a commissioner of the city of Chicago, built on this vision later in the day by insisting "there is no one sector that is going to be able deliver the solution" to today's social issues. 3. "Social business" is on its way to becoming simply "business." William Towns, executive director of Benefit Chicago and a Loyola alumnus, spoke passionately about the growing movement to "not only yield profits, but also yield purpose." In his view, the Baumhart Center is a key part of the momentum that "will have a tremendous impact on businesses around the world" and help to galvanize the entire business community behind a social agenda. View photos from the Leading for Good conference in the gallery below or on Quinlan's Flickr page.